Start reading Hope In The Dark (Canons) on your Kindle in under a minute. "Hope In the Dark changed my life. During a period of pervasive cynicism and political despair, the first edition of this book provided me with a model for activist engagement that I have held dear ever since. Today, as movements for climate, racial, and economic justice sweep the globe, its message is more relevant than ever. In her inimitable and inspiring way, Solnit reminds us that social change follows an unpredictable path. Despite all the obstacles, we must not lose sight of the fact that profound transformation is possible. This book's compact size belies its true power. It provides succor and sustenance, fuel and fire, for those fighting for a more just world." "Rebecca Solnit is a national literary treasure: a passionate, close-to-the-ground reporter with the soul and voice of a philosopher-poet. And, unlike so many who write about the great injustices of this world, she is an optimist, whose faith is deeply grounded in a knowledge of history. This is a book to give you not just hope but zest for the battles ahead." "Time and again she comes running towards you with a bunch of hopes she has found and picked in the undergrowth of the times we are living. And you remember that hope is not a guarantee for tomorrow, but a detonator of energy for action today." "A slim, potent book penned in the wake of the Bush administration's invasion of Iraq; a book that has grown only more relevant and poignant in the decade since." "Seemingly lost in the woods of deceit and banality, bereft of hope, we are confronted by Rebecca Solnit and her astonishing flashlight. In a jewel of a book that is poetic in substance as well as style, she reveals where we were, where we are and the step-by-step advances that have been made in human rights, as we stubbornly stumble out of the darkness." "In this inspired meditation on the very nature of action and the reasons one thing leads to another, Rebecca Solnit, with her customary intellectual penetration, freshness of expression, and high elegance, finds new springs of hope in dark times." "In this extraordinary book, Rebecca Solnit's prose grows poetic wings that enable her to soar to a visionary height. The good news that she brings back is that our struggles--with persistence and courage--are indeed the seeds of kindness." "Move over Joan Didion...Solnit is who Susan Sontag might have become if Sontag had never forsaken California for Manhattan." "Can you imagine a cross between Joan Rivers and Simone de Beauvoir? I didn't think so, but no likelier hybrid comes to mind.... Solnit is the real activist deal: the type who gets arrested at nuclear test sites and mans the barricades at the World Trade Organization demonstrations in Seattle. She's also the real freelance intellectual deal: the much rarer type who earns her living generating reams of thoughtful, wide-ranging nonfiction." "An inspired observer and passionate historian, [Solnit] is one of the most creative, penetrating, and eloquent cultural critics writing today. In her most personal critique to date, she reflects on the crucial, often underrated accomplishments of grassroots activists. Solnit contemplates such well-studied revolutions as the American civil rights movement and the fall of the Berlin Wall, but more significantly she reflects on such recent events as successful protests against nuclear testing in Nevada, the Zapatista uprising, the anti-corporate globalization movement, the "unprecedented global wave of protest" against the war in Iraq, and such hopeful ecological successes as the return of wolves to Yellowstone and the restoration of the Los Angeles River. Solnit's rousing celebration of people who work tirelessly behind the scenes and courageously on the streets for justice and environmental health harmonizes beautifully with Studs Terkel's Hope Dies Last, and helps readers understand more clearly where we stand as individuals, as Americans, and as citizens of the world." "This slim volume, to quote the author's own reflections on the quincentennial of Columbus's discovery of America, is "a zigzag trail of encounters, reactions, and realizations." Solnit, recent winner of an NBCC award for criticism for River of Shadows: Eadweard Muybridge and the Technological Wild West, rambles from place to place and topic to topic in a discursive examination of the current state of leftist protest and activism. Unwilling to accept the bleak, almost apocalyptic worldview of many of her progressive counterparts, Solnit celebrates the hope and optimism that recent episodes reveal. She points to the resurrection of indigenous causes represented by Zapatismo, the WTO protests in Seattle and Cancun and the worldwide protests against the U.S.-led war in Iraq, and other smaller, more marginal protests. Solnit argues persuasively that engaged, thoughtful dissent is far healthier today than many believe. Activists, who operate by nature on the fringes of hierarchies of economy and power, often fail to recognize the power of activity that seems inconsequential. Her goal, in essence, is "to throw out the crippling assumptions with which many activists proceed." While Solnit's goal is admirable and her prose graceful, this book suffers from the same confusion and disorganization she recognizes as necessarily inherent to activism itself. Her examples are diverse yet disjointed; she is overly reliant on the words of others; and she often wanders into spiritual mumbo-jumbo and platitudes. While these tendencies hamper the clarity of her argument, fans of Solnit and progressives may find much to admire here." 5.0 out of 5 starsRebecca Solnit is the best thing going today. If you have any interest in writing, in the personal essay, in beautiful sentences, in thoughtful observations -- then you can't avoid Rebecca Solnit. She has created a genre all of her own, something very few writers can even dream of doing. It just isn't possible to write better than she does. She has made me fall in love with her mind. Her books reach deep into my world, turn things around, and make me see things differently. They make me different. Again, it's the very highest work that writing can ever do. I will always read anything she writes. The "subject" doesn't matter. She shows, with an almost magical eloquence that also remains natural and easy-flowing (organic), what writing is for, and just how much it can actually do. And she just gets better. She makes the world a better place. 5.0 out of 5 starsWonderful, convincing, convicting read! Trump can find new space in which to breathe, to take deep, refreshing breath and start again in the necessary work of hope. There is always too much at stake for those who look for a better world in which to live, for any of us to give in or give up. Excellent - gives an uncommon perspective on activism as a journey rather than as an attempt to gain utopia. See activism as a failure when we don't reach all of our goals, keeps us from celebrating our successes, even when they are less than our goals, and this leaves us uninspired to continue what has been good work. It's easy for political activists to overlook their own victories. Activists are driven by a bold, transformative vision of change. That vision is indispensable and is the fuel of progress, but it can also encourage activists to adopt a narrative whereby organizers defeat evil and their positive vision of the future comes into existence. But the world is far too ambiguous and chaotic for that narrative; viewing change in those terms leads activists to see their work as resulting only in defeat, which causes burnout and cynicism while discouraging new people from joining a movement. Change is never easy to see and progress never moves on a clear linear path. Solnit outlines a different vision of change, one which is unpredictable, chaotic, improvisational. Total defeats lead to revolutions generations later; technologies produced by militaries become the engine of peace; supposedly lost causes are resumed; a speech to a nearly empty audience sparks a movement. These aren't just idle theories, Solnit provides real-world examples. Solnit interrogates the ambiguities and forgotten histories of movements and finds thousands of victories; some that only changed one person's life, some that overthrew dictators -- but all victories. It's our obligation to find and celebrate these forgotten victories in order to remind ourselves of our collective power to change the world and inoculate ourselves against the despair and cynicism that would lead us to willingly forfeit the collective power that all of human history clearly shows we possess. 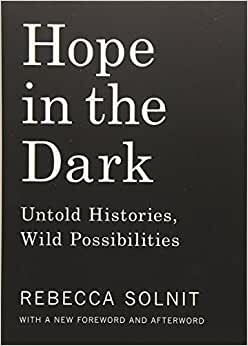 Solnit's history of activist victories is driven by a theory of hope as a discipline, not a foreign object one does or does not possess. Hope requires action and practice; action requires a belief that the world can be changed; believing that the world can be changed requires a knowledge and respect of history. The chaotic (ridiculous?) nature of the world makes it impossible to ever know the full impact of our actions; believing that actions driven by love can improve the world requires a leap of faith; all of human history indicates that that faith is the only engine of change and that it actively imposes new realities on the world, even if we can't fully predict or understand what those realities will be. That gaping unknown between action and impact is the 'dark' Solnit refers to; darkness like a womb, not depression. Changing the world requires giving up the idea that we'll understand what that change looks like. Absurd? Well... What did the dark look like to an abolitionist resisting slavery in 1814; a woman demanding equal political rights in 1790; an environmentalist opposing new pipelines in 2017? In these catastrophic times with the rise of the far-right, the corporate takeover of our government and media, the existential threat of climate change, and growing wealth inequality, despair and cynicism are easy. Every day corporate power aims to demobilize and alienate us further. Hope has never been a more vital and powerful discipline. Hope is a radical choice; a choice necessary to overcome the crises facing our planet. Solnit reminds us that choosing to practice hope isn't delusional or naive, it's a rational (though difficult) choice that has always been integral to progress. Hope is a choice that burdens us with responsibilities, responsibilities that enrich our lives. Hope requires action. Let's act. I found this book useful as a way of re-engaging with an activist mindset. Much of what she writes about activism resonated with me, and was a reason I had turned away. So while I don't agree with her on everything, I do appreciate the intellectual entry point into hope for the future.